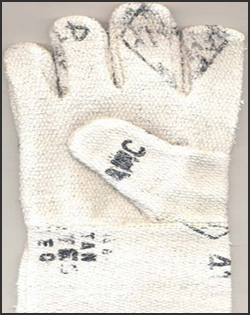 Asbestos Hand Gloves : Asbestos Hand Gloves, Asbestos Apron, Asbestos Boiler Suit, Asbestos Hood, Asbestos Shoes. We are engaged in manufacturing a wide array of Asbestos Aprons, which is manufactured as per highest quality standards, using high grade material such as spinning fiber of asbestos. Owing to their excellent strength & quality, these Aprons are used in a number of industries, such as textile machine, boilers, pipe lines, power stations, thermal insulation.